SBA Guarantee is NOT for Borrower...it only protects the Bank in the case of DEFAULT! When obtaining a commercial loan from your bank, your banker may tell you that SBA guaranteed loans are the best thing for your situation. And they may be…but be careful, because they come with many restrictions and hidden dangers. However, by carefully negotiating the terms, and structuring your personal assets appropriately, you can minimize the risks. Fees of 3% are typical: Basically you, the borrower, are paying for the bank’s guarantee up front in the form of a 3% fee. Personal guarantee: By definition, all SBA backed loans have personal guarantees. Lack of flexibility: If you ever get into trouble, and need the bank to be flexible on the terms of the note (interest rate, term, etc. ), you will find that the bank has limited ability to work with you. This is because of SBA regulations, not because the bank doesn’t want to help. 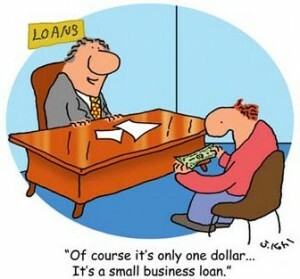 So what can you do if the bank is insisting that an SBA loan is the only option for you? There are several simple things you can do that will critical down the road if things ever get sticky. Limit the guarantors to just yourself. Do not agree to add guarantors or co-signers to the loan documents. The bank will want your wife to sign. Tell them she refuses. The bank may want another family member to sign, or may ask for “limited” personal guarantee. Say no thanks…but tell them that you still want the loan. Transfer your personal assets into another family members name BEFORE you take the loan and sign a personal guarantee. This will effectively keep them out of harms way in case of a default. Apply to multiple banks, and keep looking until you find one that is willing to accept these terms. By taking these simple steps, you can provide yourself with tremendous flexibility in the case that your business fails or is placed in the Bank Workout program. By limiting the your exposure to the personal guarantees, you provide yourself with a viable alternative in the case of difficulties. Bottom line: SBA loans play a critical role in helping small business owners get started, but they have drawbacks as well. Be careful and protect yourself. You are technically correct – the SBA SOP does allow the bank to make certain modifications to the loan, but they are limited to the parameters set out by the SBA Loan program. For example, if the loan is a SBA 7(a) loan with a maturity of 7 years, but the program allows for a maximum maturity of 10 years, Premier SBA lenders can modify the maturity without consulting the SBA. And while this might help for a short time, in my experience, these modest modifications are that are allowed are insufficient to cure the ills of most borrowers. I have an SBA secured loan that I got in 2003 that I used to purchase and renovate my office. I owe about $360,000 and the building is now worth about $100,000. I also have a second unrelated loan of $80,000. Grossley over collateralized. Can I put the building on the market for sale and then try to do a OIC for the substantial balance (will they approval a sale negotiated by me) or will they default, take building and put it on the market themselves>? Then do an OIC? Is there a time frame prior to going to loan committee whereby I can move my assets into another person’s name to protect my holdings for SBA financing? I have $350K but need a $525K loan and,, of course, the bank is over-arching for assets as well as pushing SBA on me … I want to move my assets out of my name and borrow as much as possible to have cash on hand so I can’t fail. Can you advise to the time frame permitted? I assume they do due diligence to research the state of a portfolio over a short-term period prior to close. Thanks for this great article. It nicely broke down what an SBA loan is all about. I wanted to clarify however, when the bank says that the SBA guarantees up to 75% (for example) and the bank is asking for a 25% cash injection. What exactly does that mean? Does that mean that I won’t be getting my requested amount (let’s say 100k) because the bank wants me to put in 25k of my own cash?